PORT ST. LUCIE, Fla. (December 9, 2014) – The National Volleyball League (NVL) hired beach volleyball professional Piotr Marciniak to join the coaching staff at NVL’s Club Med Academy in Port St. Lucie, FL. Marciniak brings more than a decade of experience in professional volleyball and sports management. 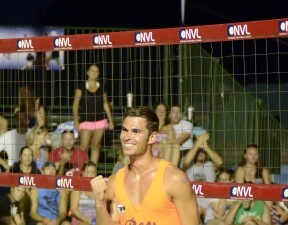 As an international and domestic player, Marciniak has nine career top three finishes including 3rd place at the U21 Beach Volleyball Swatch World Championship, and two first place finishes on the NVL pro tour – 2013 “Best of the Beach” in Las Vegas and 2014 Midwest Championships in Ohio. Marciniak was named the NVL “Best Offensive Player” in 2014 and along with partner, Matt Henderson, recognized for the 2014 “Best Upset of the Year” at the NVL Midwest Championships. Prior to joining NVL’s Club Med Academy, Marciniak was a beach volleyball coach at BeVolley Academy in Florida where he trained both juniors and top female professional players, in addition to developing tournament schedules and overseeing administrative and budgetary functions. Concurrently, he acted as a consultant to Webber International University and worked with partner BeVolley Academy to analyze and recommend business solutions to help increase revenue. Marciniak obtained an MBA in Sports Business Management from Webber International University in the U.S. and a Bachelor of Science degree in Physical Education from University of Technology in Poland. He also holds a certificate in Therapeutic Massage from ZAK Massage Therapy School. The NVL Club Med Academy includes 8 premium beach volleyball courts and is the hub of high performance training in the U.S. The Academy is also home to clinics, camps, junior and adult NVL tournaments, seminars and accreditations, collegiate competitions, and NVL and international events throughout the year. Club Med Sports Academy offers a specialized boarding school for student athletes who come from around the world to train in their chosen sport and go to school. The students enrolled at the Club Med Academy represent more than 60 countries. This integrated academic and athletic training curriculum offers a College Preparatory program as well as high performance training for volleyball, tennis, golf, triathlon, running and fitness. Click here for more information about the NVL Club Med Academy beach volleyball program.